I am back from vacation, charged with energy to blog more. Of all things in my luggage from India, a small package made me extremely happy. That package held double delight that could brighten my mornings – Coffee powder and a Coffee filter. The coffee powder was a mix of Plantation A (250 g), Peaberry (250 g) and Chicory (50 g), which is the usual combination my mom uses. I got ready to prepare the decoction. The process is quite interesting. Disassembled Coffee Filter. The upper container has been inverted to show the perforations. Add 5 heaped tablespoons of coffee powder to the upper container of the coffee filter. Level and pack the powder tightly using the stemmed disc provided in the filter. Pour a cup of sizzling hot water over the powder and allow it to percolate. Coffee decoction collects in the lower container in drops. It takes a few hours for the entire water to drain into the lower container. Transfer the decoction to a small jug or container. Store it in the refrigerator and use when required. Now, it is time for actual coffee-making. Take about ¾ cup of hot milk. Add coffee decoction according to the ‘body’ or strength you desire-weak, medium (2-3 tbsp) or strong. Add sugar (about 1- 1 ¼ tsp) to taste. Do not make it very sweet. Good coffee always bears a hint of bitterness – Don’t you agree coffee lovers? Stir ingredients with a coffee frother and that’s it. A sip of this hot filter coffee and I was at a loss for words – it felt like paradise on earth. I look forward to my mornings, just to have a taste of my favourite South Indian Filter Coffee. Caffeine in coffee works as a therapeutic against Alzheimer’s disease. Dr. Cao et al., at the University of South Florida performed a mouse study and reported that caffeine interacted synergistically with a mysterious component in coffee and increased blood levels of GCSF (Granulocyte Colony Stimulating Factor) which is greatly reduced in patients with Alzheimer’s disease. GCSF improved memory performance in the Alzheimer’s mice in 3 ways. It recruited stem cells from bone marrow to enter the brain and removed the harmful beta-amyloid protein that initiated the disease. It also created new connections between brain cells and increased the birth of new neurons in the brain. Coffee also keeps Parkinson’s disease at bay. It is associated with a reduced risk of prostate cancer. As good as it may be, coffee is not a drink for indulgence. Let us fathom what’s okay and how much is too much, when it comes to coffee. About 200 – 300 mg of caffeine a day is considered okay. In terms of cups, that translates to 2-4 cups of coffee a day. Anything more than 400 mg/day is considered harmful. It may lead to nausea, headaches, sleep difficulties, increased anxiety and even heart palpitations. To get an idea about the caffeine content of a few types of coffee, click here. Caffeine in coffee is the perpetrator. It hampers fat burning when taken early in the morning on an empty stomach. It stresses the body by increasing the blood pressure, heart rate and breathing rate. So, never wake up to coffee or for that matter any caffeinated beverage. Postpone your morning coffee to atleast an hour after breakfast. I know that this advice is a bitter pill to swallow for many. But following it would definitely do good. It stimulates the body and interferes with sleep. So, avoid coffee close to bed time. It hinders the absorption of nutrients, especially iron and calcium from food. So keep away from it atleast an hour before or after meals. It has the tendency to aggravate acidity. So those with heart burns or oesophagitis, stay away from coffee. It is associated with foetal growth restriction. It is better to avoid caffeine or atleast limit it to ≤ 200 mg/day when pregnant. It dehydrates. Do not drink coffee immediately before or after exercise regimen. Reap rewards of coffee-drinking by scheduling coffee breaks wisely, at appropriate times. Would You Still Love This Coffee? Posted in Beverages, Coffee and tagged Caffeine, Chicory, Coffee and Alzheimer's Disease, Coffee Powder, Filter Coffee, Peaberry, Plantation A, South Indian Filter Coffee. Bookmark the permalink. Many of us like to wake up to a piping hot cup of coffee. There are those who feel that the day goes awry, when they miss their morning coffee. With varieties like Americano, Espresso, Latte, Mocha, Cappuccino, Turkish and last but not the least, South Indian filter coffee to pick from, coffee breaks are all the more enjoyable and invigorating. But did you know that world’s most expensive coffee, Kopi Luwak costs roughly about US $50-80 a cup!!! Ever since my friend in FB brought up this topic, I have had a burning desire to write about it. So, what makes it so special and pricey? Let me spill the beans in the order of pleasant first to gross, later. Kopi Luwak lacks the bitterness of other coffees and has a unique aromatic flavour. Those who have drunk it describe it as the best coffee with attributes like syrupy consistency, chocolaty-caramel taste and rich aroma. This exotic beverage owes its flavour to the unusual way the beans are processed. 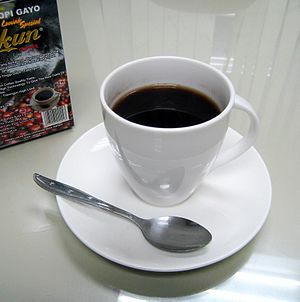 Kopi Luwak as the Indonesian name suggests, is coffee processed by Luwaks or Asian Palm Civets. These civets devour the choicest of coffee berries, among other things for food. The pulp is digested whereas the beans undergo desirable changes in the digestive tract before being excreted. The clumps of beans shrouded in the civet excreta are gathered by the farmers. They are cleaned, dried and most importantly given just a gentle roast to preserve the flavours. The beans are then ground and brewed into the world’s tastiest coffee. Those who are inquisitive about how on earth this Kopi Luwak culture evolved, should read its history. The proteolytic enzymes in the civet’s digestive tract seep through the beans. They break down the proteins into short chain peptides and free aminoacids. Most of these end products leach out of the beans during the journey through the gastro intestinal tract of the Luwak, resulting in low protein beans. Lower the protein in beans, lesser the bitterness in coffee. The Lactic acid bacteria in the gut of the civet ferment the beans, endowing them with a superior flavour. Malting of the beans in the gut add on to the flavour. The Maillard browning that occurs during roasting further enriches the flavour. The beans remain intact all through these phenomena. Massimo Marcone, Food scientist at the University of Guelph, and the author of above mentioned study, reassures people with apprehensions about Kopi Luwak by stating, “Tests revealed that the Kopi Luwak beans had negligible amounts of enteric (pathogenic) organisms associated with feces.” He also added, “The low bacteria count is likely due to the washing process performed by local Indonesians collecting the beans. The “cherry” or endocarp surrounding the bean is not completely digested by the Luwak; it must be removed during processing. This probably leads to a more thorough washing process”. So, the extensive washing, sun-drying and roasting (350-400°F) are treatments adequate to render the beans safe for human consumption. The fact that there has not been any public record reporting illness from drinking Kopi Luwak reinforces the scientist’s statements. The unusual processing, laborious task of collecting the beans clubbed with the decrease in the Luwak population due to poaching, explain the low production of this coffee and also why this gourmet brew burns our pockets. Never mind the adjectives “exotic”, “gourmet” and the like attached to Kopi Luwak. Tell me frankly, despite learning how Kopi Luwak is made, would you still love this coffee? If you are one of those die-hard coffee lovers, who is keen on tasting this exquisite coffee, do so when in Indonesia, for it costs comparatively cheaper there – just US $5-8, a cup! Kopi Luwak: Indonesia’s rich cup or ‘crappuccino’? Posted in Beverages, Coffee and tagged Civet Coffee, Exotic Coffee, Kafe Laku, Kape Alamid, Kopi Luwak, Motif Coffee, Weasel Coffee. Bookmark the permalink.